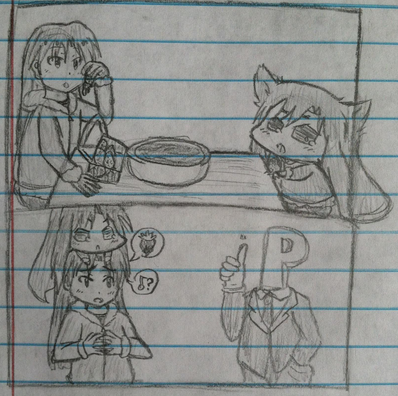 I used to draw but I quit to focus more on learning Japanese. I was thinking recently of starting to learn to draw again. Here's some old examples. 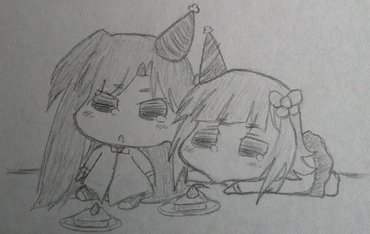 This is probably the oldest one I still have saved from back when CG started in early 2012. 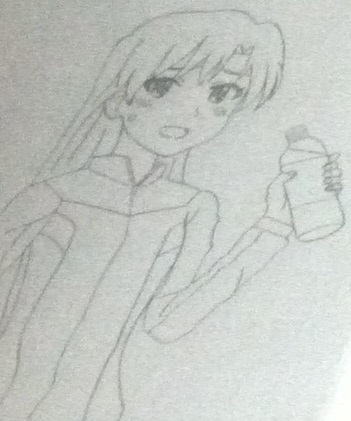 The rest of these were photographed as my scanner hasn't worked in awhile so sorry for the poor quality. This is the last one I did around 2 years ago now. I strongly envy that Yayoi because you have the bravery to shade with pencil, which I don't do for the life of me because I am terribly afraid of smudging the paper itself. 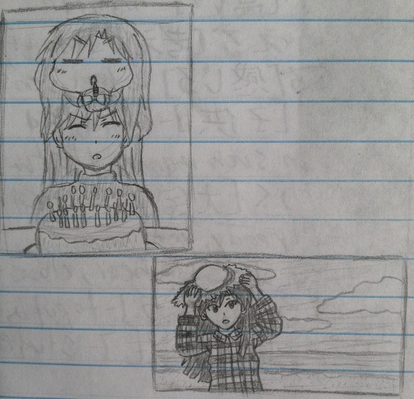 That's Chihaya in the second one, right? What is she holding? Also, can you provide English translations for the Japanese? Yeah. She's holding a heart shaped box of chocolates. "Ku?" 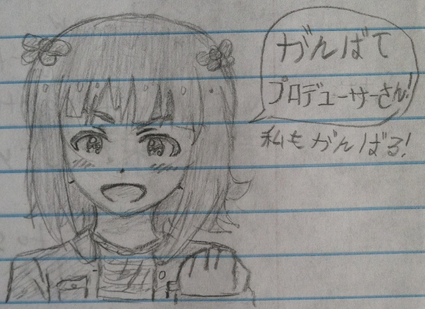 "Sha" "Toka" ""arigatou" kana (omoide wo arigatou lyric)" "Do your best Producer-san! I'll do my best too!" 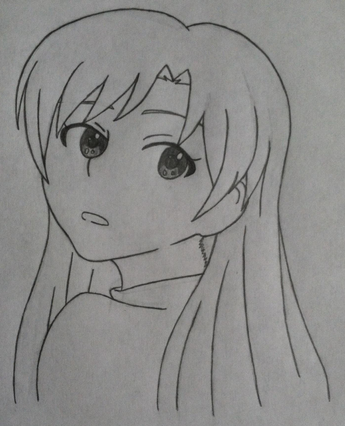 Sure is Chihaya around here. 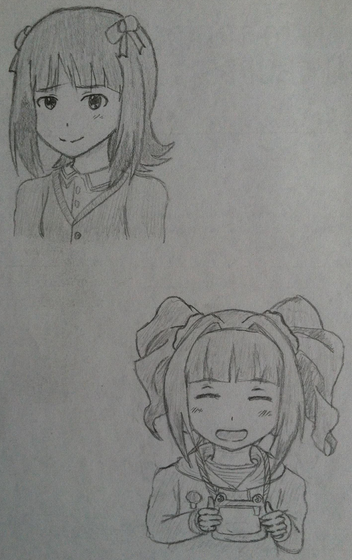 But for being base sketches, the effort is telltale -- the styling of the first one is especially reminiscent of the iM@S art style. Props to that much. Makes me want to pursue drawings again, yet there's the obligations to mind as far as life goes. Maybe things can better look to my fortune as they would to you, if you're set on returning to draw. Wow, you're really good! We have a lot of artists on this forum, don't we? 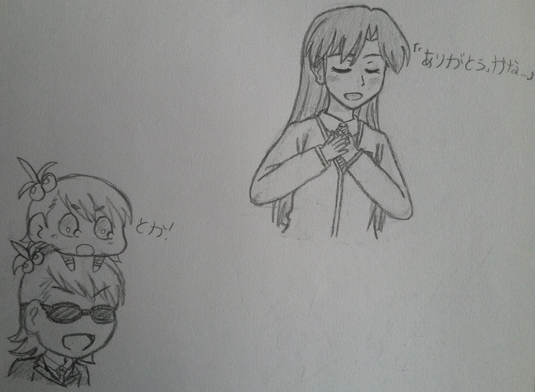 Especially impressed by that first Chihaya, all the puchidols (just all of them, I envy you and Zeta because I can't draw cute things to save my life), and that Yayoi. 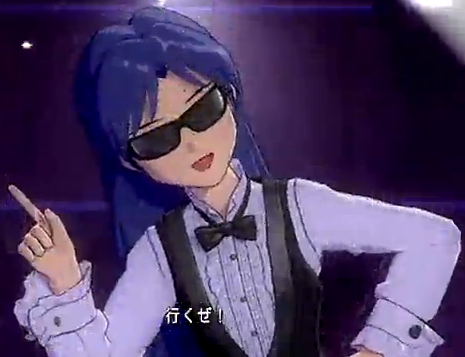 I also love Ami in shades. That's just perfect. Of course I enjoy drawing her as well. 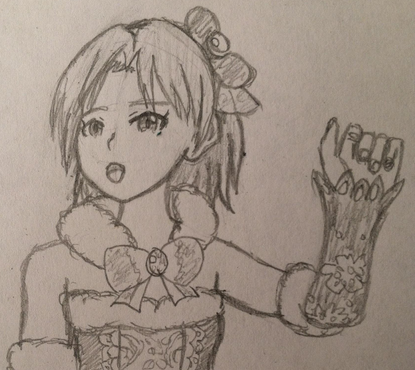 I used to draw the other idols a bit as well but don't have the images on me. I have pictures on my PSP still of characters in the black shades with a chicken on their hand and monster feet and crazy outfits like that. It's beautiful. 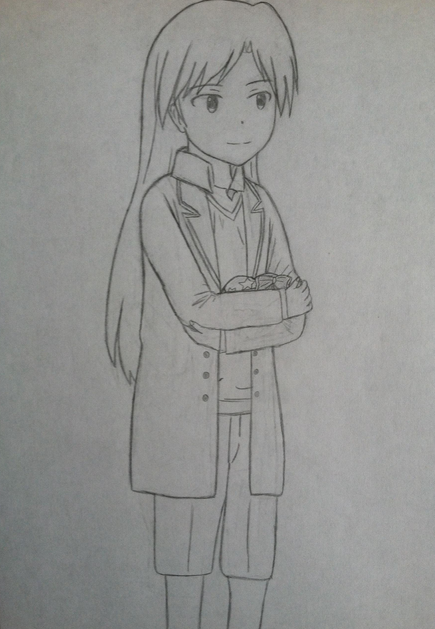 Since short hair Chihaya fan art has been more popular lately I tried sketching it myself. 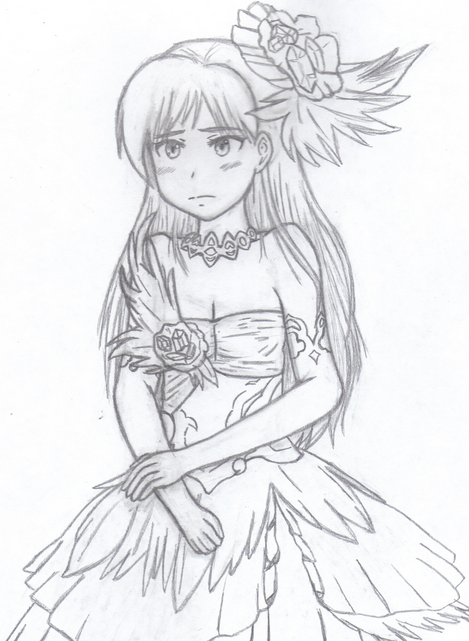 I haven't drawn anything in awhile so it's not that great. 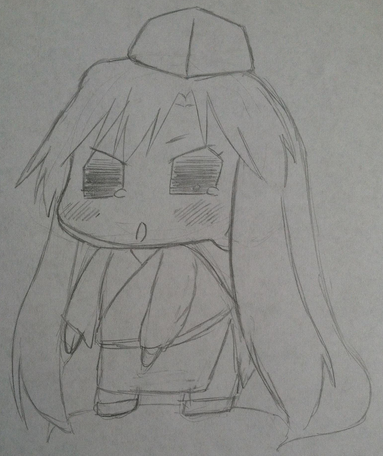 Design for a custom Chihaya plush. 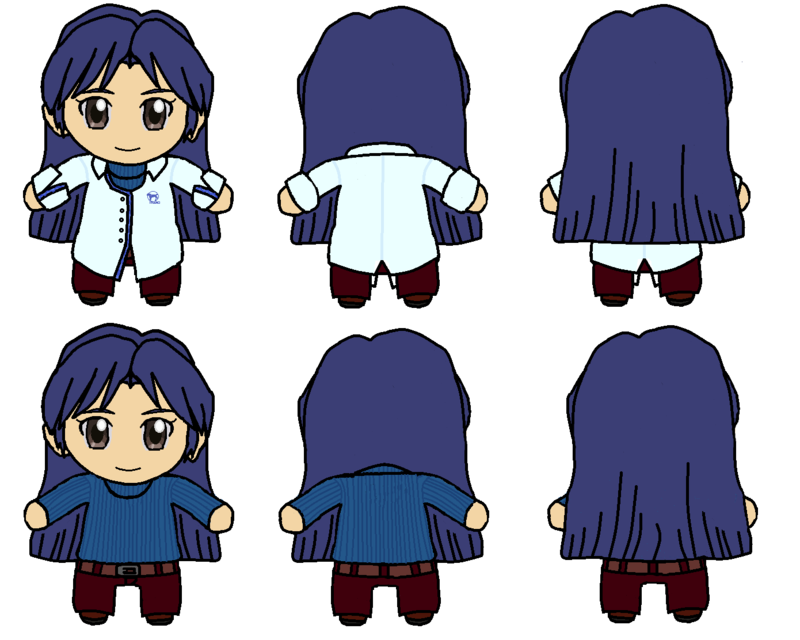 A Chihaya plush would be super cute! ! But, probably would involve very minimal stuffing. Cute concept. 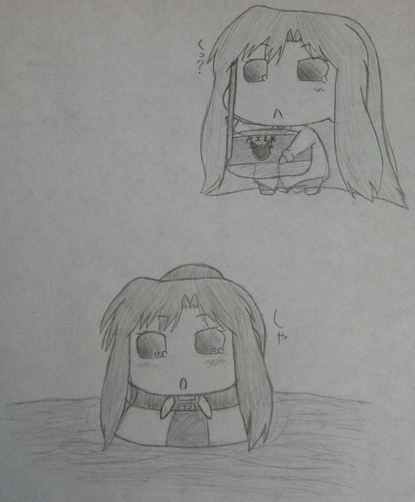 Come to think of it, though, haven't they done Puchidol plushies? I'd love those, especially. Looks cute! Did you do that digitally? You're pretty good with digital stuff, if so. These are really good, I hope you get back on the saddle and into the groove again.